Published in This Is Tomorrow, 2011. Original article here. Just as Monet’s paintings of waterlilies were originally presented in a long line, Matthew Day Jackson’s impressions of the surface of the moon stretch out across an entire wall of the Hauser & Wirth gallery. One panel follows another to cumulative effect, but as you stand in front of ‘Reflections of the Sky’, the enormity of the symbolism actually makes the piece feel almost on the small side. The subtle pattern is compelling to look at, to the degree that even as you are standing in front of it, you somehow want more. Matthew Day Jackson has a knack for drawing in his audience. With ‘Everything Leads to Another’, the artist is interested in beauty that carries a counterpart, ‘so closely that it is difficult to delineate one from the other’. Works by the Brooklyn artist fill both galleries at the Savile Row space, with the North gallery dominated by large-scale pieces such as the moonscape and ‘Axis Mundi’, a manipulation of the cockpit of a B29 aircraft bomber. Positioned next to the moonscape, the polished cockpit segment evokes thoughts of space travel, an impression strengthened by an interior filled with strange, neon-coloured anthropological artefacts, as a nod to the undiscovered. If the North gallery looks for the big picture through humanity’s push outwards, the South gallery takes the opposite approach and searches for answers by looking inward. With the notion of mortality running as a central theme, the artist has used his own body to examine what it is we are made from. Especially here is it tempting to touch Jackson’s sculptures, which are rich in texture and you suspect you may be missing out on a layer of the experience by being restrained to simply looking. The central figure is a life-sized body, carved like a topographical map. The main body is made from a concoction of materials, including wood, wax and plastic, with carefully crafted internal organs sitting heavy in the middle. Four images surround the central figure, each presenting the body in different manners. The body made from meat set in jelly is the most uncomfortable to look at, to the extent that the depiction of the burning corpse is a relief. There is a discomfort that comes with being confronted with the messiness and the vulnerability of the body mechanism, but in Jackson’s world also this is a counterpart indistinguishable from the related beauty. The exhibition concludes with a video piece, presented in a retro-style living room set. A documentary-style film, ‘In Search of … Ghosts’, plays surrounded by artwork, including Jackson’s ‘Life’ magazine covers with patches of embroidery. From the sofa in the artist’s fake living room, you are surrounded by references to space exploration and theories about the unknown; ‘who are we, and where do we come from,’ asks the video narrator, ‘what lies waiting in our future?’ But as the video continues to ponder the paranormal, it seems that whether we look into space or within our own bodies, the answers may well be the same. As Jackson points out, everything leads to another, and we can see our own reflection on every surface. Posted on 11/30/2013 by Jess. 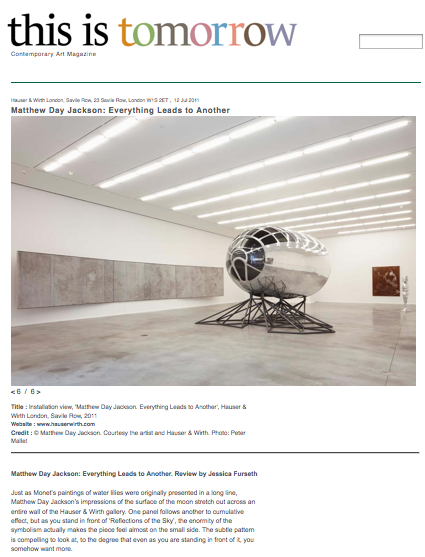 This entry was posted in Art writing and tagged art, everything leads to another, hauser & wirth, matthew day jackson, this is tomorrow. Bookmark the permalink.